Driving a motorcycle is much riskier than a typical motor vehicle. Injury from a motorcycle accident is most likely to be serious. The large bone in a person’s thigh, or femur, is the strongest bone in the entire body. It takes a great deal of force to break it. In fact, the most common way in which the femur is broken or fractured is by a car or motorcycle accident. Motorcyclists are especially prone to this type of break as their legs are completely exposed when involved in a high-energy collision. Treatment usually involves complex surgery, with the use of surgical pins to help keep the bone in place as it heals. Not only is this a costly procedure, but it is extremely painful with a long recovery time. If you broke your femur bone in a motorcycle accident, you most likely are now facing a large medical bill as well as time away from work. Ask aMissouri motorcycle attorney for advice on how to be compensated for that. The femur extends all the way down from the hip joint to the knee joint. When you envision a motorcyclist on his bike, you can see how that particular area of the body is at grave risk of injury. Not only would it absorb the brunt of the impact if the motorcycle were struck on its side, it is also the area of the body where the bike would lay if it were forced over onto its side. There have been some attempts at installing side cages on a motorcycle to protect this important bone, but they have all proved to be ineffective. A simple cast to repair the break is only effective in young children. Surgery is the only effective way to heal the bone, and because of its size will require the aid of surgical rods, plates, or pins. These devices can cause secondary problems such as infections or bone weakness. Other complications are irritation of the muscles by the hardware and injury to nearby nerves or blood vessels. Blood clots, which are life threatening, are also a possible side effect of femoral bone surgery. Such was the case with a Missouri motorcyclist after surgery on his femur. 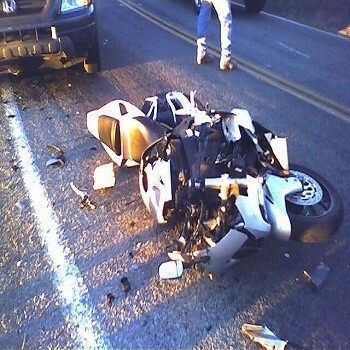 The bone in his leg was broken after he was struck by another car while driving his motorcycle. Once released from the hospital, blood clots developed that traveled up to his heart and lungs, requiring additional medical treatment. In order to pay his massive medical bills, the driver agreed to a $425,000 settlement with the insurance company. Driving a motorcycle is much riskier than a typical motor vehicle. Driving safely and avoiding taking your bike out in inclement weather are the only real ways a motorcyclist can protect themselves from a catastrophic accident. Injury sustained is likely to be grave. There are many avenues that a Missouri motorcycle accident attorney can pursue to help recover damages from the accident. If you have recently been hurt in your own motorcycle accident, it is recommended that you call upon one as soon as possible. Call The Hoffman Law Firm, L.L.C. at (314) 361-4242.